This version uses an algorithm very similar to the basic roulette computer algorithm. While it can produce predictions when the ball is at any speed, it does so in a very poor and inaccurate way. It can produce an edge only on very easily beaten wheels. Regarding his level wheel settings: It is common sense that if you predict the same spin on DVD that you will get much the same prediction. But you quickly find with this and indeed any of Mark’s computers, the predictions on the same repeated spin are as good as random. Mark clearly never properly tested this device. You need only conduct basic testing on the same repeated spin to know not even his tilted wheel settings produce correct predictions (setting for wheels with a strong dominant diamond). The downloadable files from Mark’s other customers explain the testing procedures that prove the device is incapable of producing any edge at all. The first thing you notice is the computer has engravings that identify what the device, which isn’t advisable for a covert device. Nevertheless, again he is uses the basic algorithm, but without proper clocking. Nevertheless, the method of operation is clock one full revolution of the rotor, then wait for a series of evenly spaced pulses that he calls “biomorphic feedback” (vibrations). When vibration pulses begin, you observe the position of the ball when the vibrations occur. These positions are called intersection points. When the ball reaches a speed slower than the vibration pulses, you take the reference number (number ‘A’ as per visual ballistics procedures). After each spin, note the winning number (B). You collect 30 or so spins this way and build a scatter chart. Find the best peak location, then on the next spins, you do everything the same way except you adjust number ‘A’ by whatever number of pockets. This is not a roulette computer. It is called a “thumper”. It is basically a “beat keeper” device that gives pulses at regular intervals. It is more a visual ballstics aid than a roulette computer. You can download free software that does exactly the same thing for free, and install it on any mobile phone. This is his latest device. Mark claims this device can be built into virtually any object such as a pen or wristwatch. Still it uses the same simplistic algorithm which is no more accurate than the free visual ballistics course I teach. Additionally, having an object visible in your hand is a blatant red flag to casino staff. And casino staff will be attentive to you either holding a pen while playing, or clicking buttons on a wristwatch. Roulette computer application must be hands-free to be practical. His Evolution device is in some respects similar to the free computer given to my roulettephysics.com players. It is more akin to a “thumper” than a roulette computer, and uses a series of vibrations to tell you where to bet. 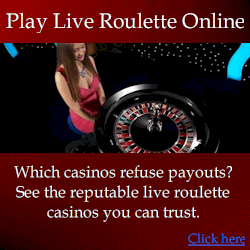 Again, I suggest conduct your own research and ask your own questions to any roulette computer vendor. You can expect every vendor to claim their computer is best and all others are scams. See Steven Hourmouzis response to false allegations. You simply need to make up your own mind. Keep asking questions: eventually the person who’s not telling the truth will either change their story, contradict themselves, make an excuse to avoid answering, respond with diversionary information, or respond with blatant and unsubstantiated nonsense.